Edwards was only 15 years old when the MORMON'S made him participate in the Mountain Meadows Massacre. 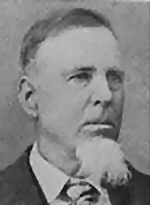 WILLIAM EDWARDS a MORMON SHOOTER AND CLUBBER and a private in the Iron County Militia; born in Worchestershire, England, Edwards' principal occupation was farming but he also served as constable and postmaster in Beaver for many years. In September 1857, Edwards was fifteen years old and living in Cedar City. Probably on Thursday the 10th, Edwards was among a detachment of militia reinforcements ordered to the Meadows. He described arriving at the Meadows that day, the council meeting that night that solidified a plan of action, and the massacre on Friday the 11th. In 1924, less than a year before his death and more than sixty-five years after the massacre, Edwards made a short affidavit concerning his presence at the massacre as a fifteen-year-old youth. His is probably the last of the militia statements on the massacre. Edwards is not mentioned in the 1857 Iron County militia muster rolls, nor does any other witness identify him as a participant in the massacre or even present at the Meadows. Yet there is little reason to doubt his statement: he was among several militia teenagers who had been pressed into joining the militia detachment bound for the Mountain Meadows and he witnessed the massacre. Information on the above Mormon Shooter and Clubber, was obtained from the following: The 1857 Iron County Militia Project, Mountain Meadows Massacre Assassins, Bagley; Affidavit of William Edwards; Lee, Mormonism Unveiled ; Lee Trial transcripts; Shirts.